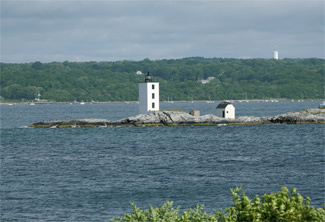 Dutch Island Lighthouse sits on a small, rocky island off Conanicut Island, in the West Passage of Narragansett Bay. In 1825, the State of Rhode Island deeded the southern tip of Dutch Island to the U.S. government for the purpose of building a lighthouse, and the following year a thirty-foot-tall tower was constructed using stone and slate extracted from the island. A four-room keeper’s dwelling was attached, church-style, to the tower, which housed a collection of eight lamps and reflectors showing a fixed white light. With a focal plane of fifty-six feet above the water, the light could be seen for thirteen nautical miles. William Dennis, an American colonial and ship captain, was on a vessel in Europe when he heard news of the Boston Tea Party. The uprising prompted his quick return, and soon he was fighting in the Revolutionary War on the side of the colonists. In 1827, Dennis, who commanded six different privateering vessels and had twice been taken prisoner during the war, was appointed the first keeper of Dutch Island Lighthouse at the ripe-old age of seventy-seven. Toward the end of his service, Keeper Dennis was not up to the job of minding the light, so his son Robert took over most of the responsibilities. When complaints were made that Robert was not residing on the island, there was talk of removing his elderly father from the role of keeper, but Robert wrote an impassioned letter pleading that his father be allowed to live out his remaining days at the lighthouse. William Dennis finally retired in August 1843 and then passed away one month later at the age of ninety-three. After Robert H. Weeden and William P. Babcock had served as keepers, Robert Dennis returned to Dutch Island Lighthouse in 1846, this time as the official keeper, and looked after the light for the next seven years. In 1850, Captain Howland visited the lighthouse, found the lighting apparatus “in first-rate order,” and provided the following description of its keeper: “Mr. Dennis I believe to be a good, honest man, and I think shows a good light, although a moderate consumer of oil.” At that time, the eight lamps used in the lantern room were together consuming 237 gallons of oil per year. In 1855, E.B. 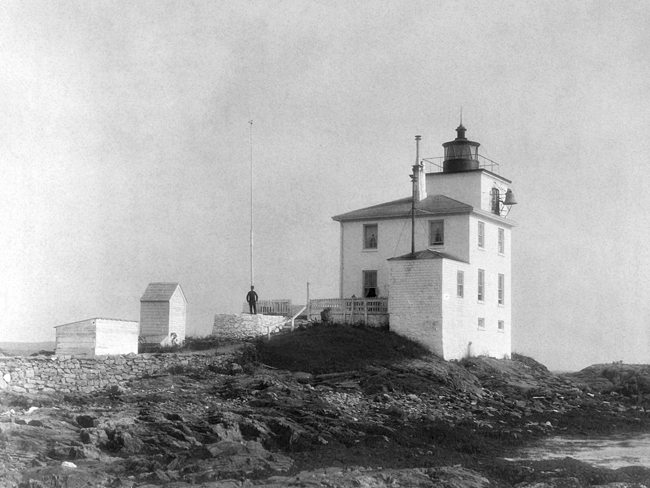 Hunt, a lieutenant in the Corps of Engineers working at the Lighthouse Engineer Office in Newport, reported: “The lantern and stairs of the tower of Dutch Island light are extremely bad. The stairs are very rough stone, dark, cramped, and slippery in winter. The lantern is wretched, astragals very broad, glass bad, and the door so broken that it cannot be closed tight. It is very desirable that the lantern, illuminating apparatus, and stairs of this tower, if not the tower itself, should be rebuilt.” A sum of $2,000 was deemed sufficient for the task. On August 18, 1856, Congress provided the generous amount of $4,000 for “reconstructing the light-house tower and for new illuminating apparatus at Dutch Island.” This sum was sufficient to not only build a new tower but a dwelling as well. The new lighthouse took the form of a two-story brick keeper’s dwelling attached to a forty-two-foot-tall, square, brick tower. The new dwelling had about 1,200 square feet of living space, with a parlor, living room, dining room, and kitchen on the first floor and three bedrooms on the second floor. A fourth-order Fresnel lens was installed in the new tower to produce a fixed white light. In 1924, the light’s characteristic was changed to flashing red. Following the Civil War, gun batteries were placed on Dutch Island, and by the late 1800s the defensive works had grown to become Fort Greble, named after Lieutenant John T. Greble, an early casualty in the Civil War. The fort was home to as many as 495 soldiers during World War I, but was later abandoned in favor of other nearby installations. Remnants of the fort can still be seen on the island today. Extensive improvements were made at Dutch Island Lighthouse in 1878. A capacious cistern was built in the cellar of the dwelling and connected to the kitchen, and atop the lighthouse, a lightning rod was installed. A fog bell operated by machinery was also added to the station that year. Marian Fife, wife of Keeper George Fife, was appointed assistant keeper to help with the added workload of running the fog bell. The Fifes were both born in England, but later moved to Brazil where their first two daughters were born. A third daughter was born on Dutch Island. When the Fifes left the lighthouse in 1883, the position of assistant keeper was abolished. Albert Porter arrived at Dutch Island in 1901 after having served as an assistant keeper at Stratford Shoal Lighthouse from 1897 to 1898 and then as head keeper of Romer Shoal Lighthouse. In 1911, Porter was permitted to travel with his wife Mary to New York after the sudden death there of his father. Following the couple’s return, Albert confronted his wife with “certain stories of misconduct on her part while at that place” that had been brought to his attention. His wife then admitted that before their marriage she had led a “fast life in New York,” and she shortly afterward left the island in shame. Lighthouse authorities arrived a month later to investigate the matter, and found that only one bedroom in the dwelling appeared to be occupied. When asked why his clothes were in Catherine’s room, Keeper Porter replied “that room is drier,” and when asked where he slept, he said “in a chair in the dining room.” Convinced of Porter’s moral turpitude, the authorities asked for and received his resignation. The 1910 Census lists nineteen-year-old Catherine Lyal as a cook on Dutch Island working for Fort Greble’s doctor, and two households away, on the same page of the census, are found the listings for Albert and Mary Porter. Fire nearly destroyed the Dutch Island Lighthouse in 1923, when Keeper John Cook’s mother-in-law piled up what was left of the previous year’s crops behind the station and decided to burn them. It was calm when she lit the fire, but a short time later the wind picked up, scattering sparks and igniting a fire in a nearby field. Keeper Cook was away at the time, but his alert wife quickly called for help from nearby Fort Greble. The few men who were stationed at the fort at the time all raced to the lighthouse to battle the blaze. The wind directed the fire towards a storage building that was soon engulfed in flames and then started to blow towards the lighthouse. Although the storage building was a total loss, the volunteer firefighters were able to save the lighthouse and finally extinguish the fire. An investigation concluded that the fire was an accident, and no punitive action was taken. When the light was automated in 1947, the Fresnel lens was replaced with a 375 mm lens. The Coast Guard demolished the neglected keeper’s dwelling and outbuildings on Dutch Island in 1960, and then two years later transferred all of the lighthouse reservation save the tower to the State of Rhode Island. In 1972, the Coast Guard decided to deactivate the light because, as one Coast Guard official wrote, “the light appears to have outlived its usefulness because it was out for a week last month and several days last Fall before someone reported it.” Local mariners and residents protested the announced closure, and the Coast Guard relented and kept the light operational. In 1979, vandals put the light out of commission, and the Coast Guard decided not to incur the expense of repairing the beacon. In 2000, the lighthouse was leased to the American Lighthouse Foundation, and the Dutch Island Lighthouse Society was established to raise funds to preserve and restore the tower. By July 2007, the society had raised almost $150,000 and was awarded $120,000 under the Transportation Equity Act for the 21st Century. Using $160,000, the society hired Keith Lescarbeau, of Abcore Construction, to stabilize and weatherproof the tower and restore its exterior. Lescarbeau had previously worked on the restoration of the Plum Beach and Rose Island lighthouses and said the Dutch Island tower was structurally “very, very sound.” Work on the lighthouse was carried out in 2007, and thanks to an anonymous donor, the tower was activated as a private aid-to-navigation on November 18, 2007, using a battery-powered, solar-charged light. In 2012, an endowment fund was established to fund the perpetual maintenance of the lighthouse. The goal for the fund is to maintain a balance of at least $200,000. Head: William Dennis (1827 – 1843), Robert H. Weeden (1843 – 1844), William P. Babcock (1844 – 1846), Robert Dennis (1846 – 1853), Benjamin Congdon (1853 – 1859), Matthew M. Trundy (1859 – 1865), William W. Wales (1865 – 1873), Andrew King (1873 – 1875), George W. Fife (1875 – 1883), Henry W. Crawford (1883 – 1885), Lewis T. King (1885 – 1901), Albert Henry Porter (1901 – 1915), John J. Cook (1915 – 1927), John H. Paul (1927– 1931), John D. Davies (1931 – 1934), Stanley Gunderson (1934 – 1935), William C. Anderson (1935 – 1936), Ernest H. Stacey (1936 – 1947). Assistant: Marian Fife (1878 – 1883). “Keepers of the Dutch Island Light,” Sue Maden and Rosemary Enright, The Jamestown Press, October 2009. Located on the southern tip of Dutch Island, south of the Jamestown Bridge in the west passage of Narragansett Bay. For a larger map of Dutch Island Lighthouse, click the lighthouse in the above map. 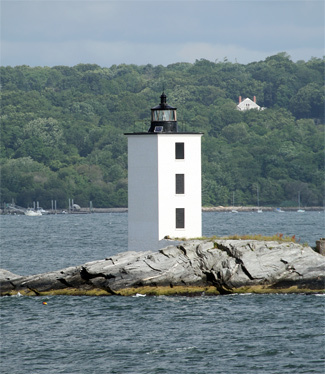 Dutch Island Lighthouse is best seen from the water, but a decent view from land is possible by following these directions: From Highway 138 on the eastern side of Conanicut Island, take Canonicus Avenue south 0.9 miles to Narragansett Avenue. Turn right on Narragansett Avenue and drive 0.4 miles to S. West Avenue. Turn left on S. West Avenue and follow it to the narrow neck of land, which leads to the second lobe of the island. At this point, the road becomes Beaver Tail Road. Just after the narrow neck, turn right on Fort Getty Road, which will lead to a camping area from which you can view the light. Please note that you may be charged an entrance fee. 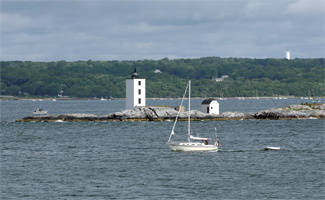 Rhode Island Bay Cruises offers a 10 Lighthouses of Narragansett Bay cruise that passes by Dutch Island Lighthouse. 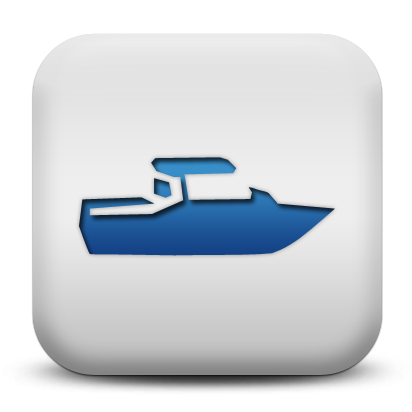 Save the Bay offers lighthouse cruises that pass the lighthouse. Access to Dutch Island has been restricted for several years due to collapsed cisterns and exposed bunkers. The lighthouse is owned by the Rhode Island Department of Environmental Management and managed by the Dutch Island Lighthouse Society. Grounds/tower closed.